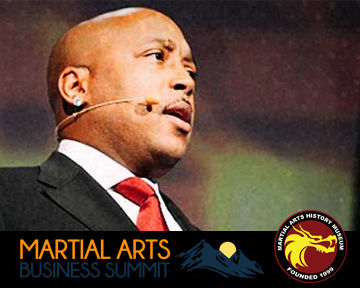 BURBANK, CA – Business giant Daymond John of Shark Tank, will be the keynote speaker for this year's Martial Arts Business Summit (MABS) in New York. Hosted by martial arts marketing guru Michael Parrella, MABS is the premiere convention for the martial arts business industry. A portion of this year's proceeds will benefit the Martial Arts History Museum in Los Angeles. The MABS has become the leader in creating a comprehensive understanding of marketing the martial arts, becoming a leader in the community and establishing a productive business plan to develop a successful financial environment. Speakers this year includes of a list of prominent, successful individuals experienced in internet-based marketing, business sales systems, social media technologies, student recruiting and the addition of martial art events such as student birthday parties that can create a substantial revenue. Some of those prominent individuals include Joe Polish, Bedros Keuilian, Perry Belcher, Michael Bernoff, Nick Dougherty, Kelly Murray, Ryan Healy, David Tendrich, Chris Casamassa and host Michael Parrella. Keynote speaker for this year's event will be mega-multi-millionaire and founder of Fubu, Daymond John, star of Shark Tank, as he shares his story of sacrifice, hard work, near-failure and perseverance. This year, MABS will present their lifetime Achievement Award to one of the legendary pioneers of Brazilian Jiu Jitsu, Rigan Machado. “It is these types of summits that will help the martial arts industry become a better, financial institution. With courses on social media, internet solutions and established marketing techniques, martial arts school owners can not only maintain their schools, but earn a substantial income,” says museum president Michael Matsuda. A portion of the funds raised at this event will be donated to the Martial Arts History Museum. “The museum is something for the entire community. Without a museum, all that wonderful history and those sacrifices that were made, will all be lost. We appreciate Michael Parrella for supporting this great effort,” concludes Matsuda. For information about MABS, please visit www.martialartsbusinesssummit.com. For information about the Martial Arts History Museum, visit www.Mamuseum.com.